Children have the option of bringing their own packed lunch or having a school dinner. 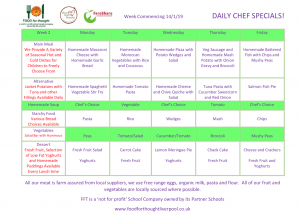 To assist with admin we ask that children stay on their chosen food choice for the duration of a half term. From September 2014, all children in Reception, Year 1 and Year 2 are entitled to a free school meal. If your child has any allergies to any food, we ask that you tell the class teacher or office staff as soon as possible. You can view our latest menu at the bottom of this page. We ask that parents and carers sending children with a packed lunch try to ensure that it is a healthy packed lunch. 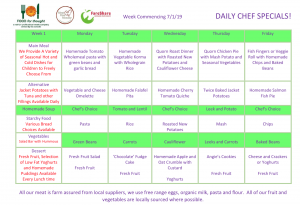 Our kitchen staff create menus offering children a choice and variety to their meals. 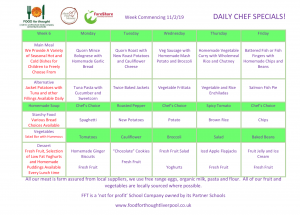 The school dinners are healthy and there are a range of delicious options for the children to choose from. The cost of school dinners is £1.80 per day or £9.00 per week. We have recently changed our lunch providers and we now use Food for Thought. You can find out more about them via their website. 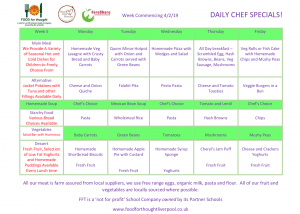 The menus for this term are below. Some families will be entitled to free school dinners. 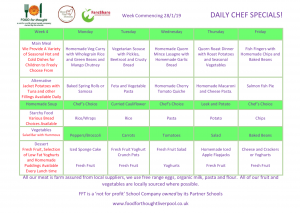 To see if you are entitled to Free school dinners please visit the Liverpool City Council website. Alternatively, the office staff will always be willing to help you complete these forms.